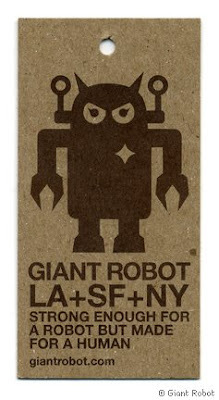 One of my favorite robot logos is this wonderful little gem by Giant Robot. My husband recently got me a new Giant Robot tee shirt and this was the hang tag on the shirt. I just love the tagline "strong enough for a robot but made for a human." Ha! 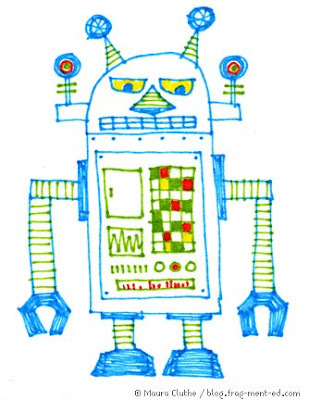 Since getting the tee shirt and keeping this tag, I've had this robot shape in my head lately so I thought I'd try to draw my own robot based on the shape of the Giant Robot logo. This is the result. thanks for the plug for TUL pens and site. what kind of Tul pens do you like? send me your contact info. and we'll send you some for, like, free!